1. Take the forks and wedge their tines / prongs together as shown in the picture. You can try this with plastic forks too, like we did, but the most effective are steel forks. 2. We need to insert the toothpick between the tines / prongs of the fork. 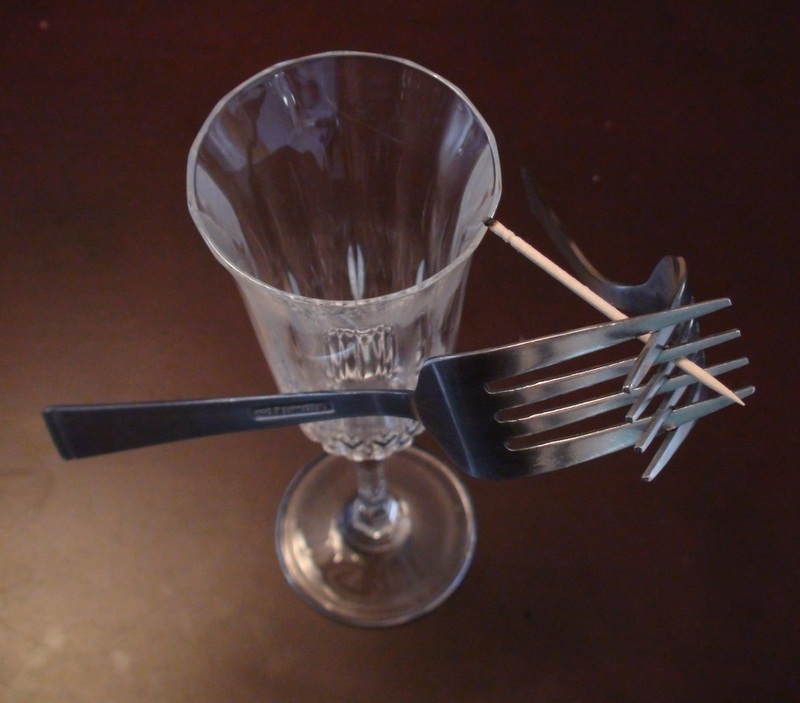 To do this, we first need to find the mid-point of the forks by balancing them on your finger. Once it balances well, insert the toothpick at this mid-point. 4. Once you have mastered the balancing, you can show off a little. Have your Mom / Dad light a match and burn the end of the toothpick that is hanging over the inside of the glass. The toothpick burns down to the very edge of the glass but the forks do not fall! The center of gravity of any object is the point about which you can balance the object as if all the masses were concentrated or gathered at this point. That means, it's the point at which the object balances from left to right, front and back, and top and bottom. The center of gravity in the balancing fork is directly below the spot where the toothpick rests on the rim of the glass. Look closely and you will see that the fork handles are positioned below the toothpick. So, the center of gravity is directly below the point where the toothpick is balanced (called the pivot point). The center of gravity, where the forks balance front and back, left and right, top and bottom, is actually hanging in mid-air! Do you remember learning to ride your bike without training wheels? It is all about balance; how you position your body from the left and right, top to bottom and front and back. Till you find the right balance you are wobbly, needing someone to hold the bike, sometimes veering too far left, or even crashing into the sidewalk. You keep practising till you achieve balance and can take off on your own.